As LT and I sat, drinking coffee along the Streets Of Tanasbourne, a cow wearing a red and black dress and a string of blue pearls walked by our table. I have no idea why. 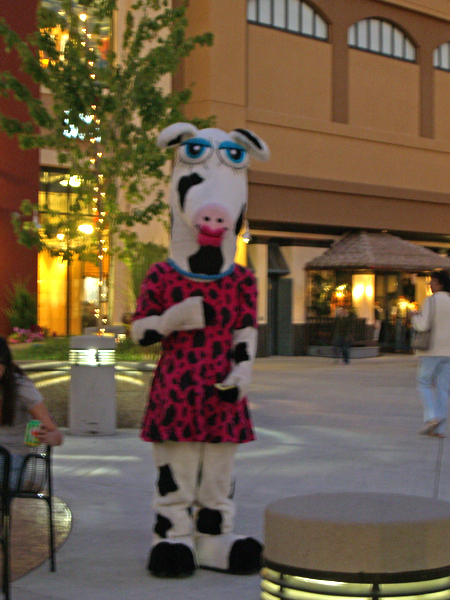 Disturbingly enough, I think it was a guy in that costume. I think this one will have to be filed under the keeping Portland weird heading. I blame the blurry, bad shot on surprise. OK… and maybe too much coffee. I didn’t get them finished before midnight, that’s true. I made a valiant effort, but fell asleep in my chair and woke up to hear the bell tolling the witching hour. Unfortunately it was one of those times when I didn’t continue knitting in my sleep, and there was still about an inch of ribbing on the top to do. I finished them up this morning. They’re a simple 4×1 rib, with a 1×1 rib at the top. The heel flaps are in heel stitch, with garter edges. I used my standard sock no-pattern. It might be better that I didn’t keep knitting. Sometimes when I do that I wake up to find that I’ve been knitting an entirely different object than I was knitting when I nodded off. But ribbing… maybe I could have handled that. I have cast on the pair of men’s socks that are next on the Socktober list. 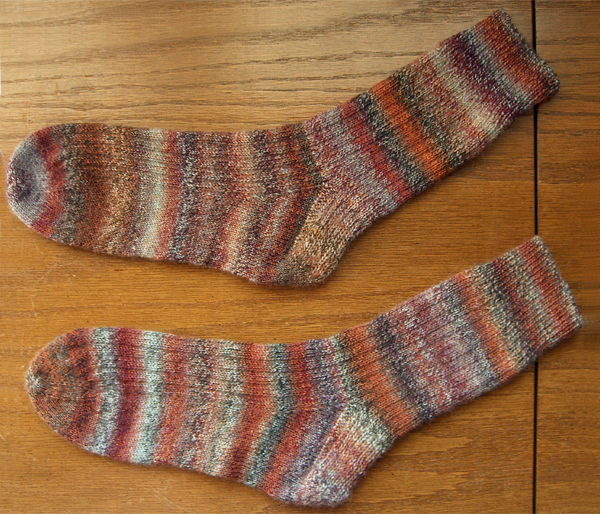 I think I might do the Father and Son Socks in the Fall, 2006 issues of Interweave Knits. 15 days to finish this pair… and the race is on!